The Maplewood Township Environmental Advisory Committee has announced that a cleanup of the East Branch of the Rahway River will take place this Saturday, May 4. Those interested in volunteering to help clean up to river should come to the committee table on Dunnell Road near the bridge to the Civic House between 11:00am and 3:00pm. Interested volunteers should bring footwear suitable for walking in the river. Gloves and bags will be provided. The event occurs on the same day as South Orange River Day, which will be taking place near the Duck Pond in South Orange. A river cleanup will also be taking place in Millburn. Police in West Earl Township, Pennsylvania report that a South Orange woman struck and killed a man while driving on a state highway on Thursday, April 24. LancasterOnline.com reports that community leader John O. Rineer, Jr., of Ephrata, Pa., was driving a vehicle which was pulling a trailer on Route 222, when a sign fell out of the trailer. Police said that Rineer pulled over to the side of the highway, and then walked onto the highway to retrieve the sign. While he was attempting to remove the item, a 60 year old South Orange woman allegedly struck Rineer. The incident happened at approximately 8:20pm. The driver then called 911 to report what happened. Rineer was pronounced dead at Lancaster General Hospital later that evening. No charges have been filed. South Orange Police report that a 2006 Dodge was broken into overnight on April 22. According to the SOPD website, a Center Street resident reported that an unknown actor(s) removed change from the vehicle, which was parked in the resident's driveway. There were no signs of forced entry. SOPD also reported that a 27 year old Brooklyn woman was arrested on April 26 at approximately 1:30am. The SOPD website said that "officers responded to a call of a possible crime involving a motorist on Valley St. Upon arrival it was discovered that the above subject had been operating her vehicle while under the influence of alcohol. The subject was arrested at the scene without incident and processed accordingly". In addition, two 15 year old males and one 17 year old male were charged on April 27 after allegedly being in possession of CDS. The SOPD police blotter reported that "officers responded to a residence on Waverly Pl. on a call of three suspicious juveniles in the rear yard of a dwelling". According to SOPD, the three juveniles were hiding in the yard when they were allegedly found with CDS, and were transported to police headquarters and processed accordingly. Send us your news: placenjwebsites@gmail.com. The Jersey Animal Coalition (JAC) is breaching their lease with the Townships of Maplewood and South Orange Village, according to a letter sent by Village Administrator Barry R. Lewis, Jr to Ruth Perlmutter, who is the founder and president of JAC. "JAC is in breach of the Lease as the Township of South Orange Village is unable to bring its strays to the JAC facility", Lewis wrote. "The result is that the village is incurring expenses to bring strays to Associated Humane Society (in Newark) as an alternative". The letter continued to say that "the Village will look to the JAC for reimbursement for all additional costs and expenses that the Village is incurring during this closure". In the letter, Lewis also requested that Perlmutter provide the Village with a current copy of JAC's fee schedule, proof that the shelter is "competent to care" for the animals, proof that the shelter is licensed by the state, proof that the shelter is in compliance with state and village licensing requirements, certificate with proof of workers' compensation insurance, proof of fire and extended coverage, proof of liability insurance, and certified financial statements from the last three years in order for JAC to be reissued a license to operate the shelter. In addition, according to a notice issued on April 21 by South Orange Code Enforcement and Inspections director Anthony Grenci, JAC is in violation of the New Jersey State Uniform Construction Code Act. The notice said that JAC installed a shed without a building permit or zoning approval, and will not be issued a certificate of occupancy or approval until the violation is corrected. Plus, JAC must pay a fine of $2000. Another letter was sent by South Orange Village health officer John Festa to Dr. Michael Santiago, the JAC Veterinarian of Record on the same day. Festa told Dr. Santiago that the shelter is under quarantine because of an order by the South Orange Department of Health, but is closed because of an unsatisfactory rating given to the shelter after an inspection by the village and state health departments. Festa explained this by saying that even if the quarantine was lifted, the shelter would remain closed until the shelter receives a conditional or satisfactory ranking during a re-inspection. Festa said that in order for the quarantine to be lifted, JAC must have cats who were showing signs of ringworm tested to confirm whether or not any of the cats have the disease. In the tests show that any of the cats are infected with ringworm, proper written isolation and treatment protocols must be prescribed and supervised by the veterinarian of record. In addition, the veterinarian of record must "create and maintain documentation on daily treatment logs, of the medication that the animals are receiving, including the prescription and instructions for the use of the medication and duration of treatment as described by the veterinarian. Such records must be created for each of the animals determined to have ringworm". The letter also said that at the time of the inspection, there were no written disease prevention protocols, disinfection procedures, or healthcare programs for each animal, "all of which are required to be created, maintained and supervised by the Vet of Record". Plus, Festa wrote that "it is noted that the entire facility shares a ventilation system, and that bedding for animals throughout the facility was supplied from the laundry room where the suspected ringworm infected cats were housed. Thus, every animal in the entire facility will require treatment as they have been exposed". According to the letter, other requirements needed for the quarantine to be lifted include that the staff members must have received in service training and are following the orders of Dr. Santiago, carpeted cat furniture in the cat rooms must be disposed of and replaced with nonporous furniture, all bedding must be disinfected, the entire facility and all enclosures must be decontaminated, and an isolation room must be created solely for the purpose of holding animals with signs of communicable disease. In addition, staff members should wash their hands thoroughly after handling animals in the isolation rooms. In the letter, Festa told Dr. Santiago that when the village does lift the quarantine, it will only be on a conditional basis, and he would be expected to provide monthly reports regarding the progress being made to implement the issues listed above. Festa concluded his letter by telling Dr. Santiago that "the Village expects you, as vet of record, to create, facilitate, supervise, and certify. Many of these requirements will require you to be onsite and hands on, and cannot be fulfilled remotely". The violations and letters were obtained after a public records request was filed by Nancy Schetelick, a former JAC volunteer coordinator. The South Orange Police Department reports that three people were arrested for allegedly being involved in a Lenox Avenue house burglary on April 12. According to the SOPD website, "detectives were able to recover a vast majority of the jewelry that had been stolen from the residence". A 23 year old, 16 year old, and a 17 year old, all from Irvington, were taken into custody on April 15 following an investigation by the SOPD Detective Bureau. The SOPD is still continuing their investigation. First on Essex County Place: The Jersey Animal Coalition (JAC), which operates South Orange and Maplewood's only animal shelter, pled not guilty to over 50 charges on Tuesday at South Orange Municipal Court in Maplewood. The shelter was placed under quarantine by the South Orange Department of Health following an inspection by village and state health officials on March 12. JAC president and founder Ruth Perlmutter, who was not present at the hearing, had also been facing two separate charges dating back to February. However, South Orange Municipal Court Judge Jonathan H. Rosenbluth dismissed those charges in court. Judge Rosenbluth said that Perlmutter will now be considered an officer of JAC in court, and therefore faces no personal liability. When asked in court by Judge Rosenbluth, attorney William Strazza, who is representing JAC, said the animals who live at the JAC Shelter are being cared for. Several former volunteers who appeared at court were doubtful of that statement. One former volunteer, who asked that she not be named, told Essex County Place that "they (JAC) said that the animals are doing good. Unless they've doubled their staff in six weeks, the animals aren't doing good". The former volunteers said that the shelter has been closed multiple times before, but never for this long. "We're concerned about the animals", said Roslyn Dreydoppel, "it is a filthy shelter". Some of the former volunteers claimed that the village knew about the alleged problem and had not taken sufficient action until now. "The town ignored it for years...the state was tipped off", said a former volunteer, who asked that she not be identified, "It should have been closed years ago". South Orange Municipal Prosecutor Gracia Robert Montilus spoke to a few of the former volunteers after the hearing. One of the former volunteers called the not guilty plea "a disgrace". Montilus said that the charges are "extremely egregious", and said that he is planning a meeting for volunteers who say that they have witnessed the alleged violations. Judge Rosenbluth said that these are "very serious charges...(with)...very serious consequences". The case will now enter the discovery stage. JAC must respond by May 13, and the prosecution must respond by June 17. Judge Rosenbluth said that a conference will be held on June 17 to discuss "issues as to the operation (of the shelter)". The JAC Shelter remains under quarantine, however the former volunteers stressed that the shelter is in need of donations, especially food, towels, litter, and cleaning supplies. The South Orange Police Department reports that a carjacking took place on Saturday, April 19 on Irving Avenue. "A Montvale resident stated that on Saturday 4-19-14 at approximately 11:30pm he was pulling into a driveway on Irving Ave. when he was robbed at gunpoint by two masked actors. The victim stated that he was about to exit his vehicle (2009 Mercedes) along with his female friend when the actors approached the vehicle on foot in the driveway and demanded their property and the vehicle. After obtaining the victim's property the actors fled in the stolen vehicle east on Irving Ave. An Officer observed the carjacked vehicle along with another suspect vehicle on Centre St. and engaged in a pursuit of same into the city of Newark. The pursuit lasted a short period of time before terminating same. The actors are both being described as black males wearing ski masks and approximately 6'0" in height and believed to be in their 20's or early 30's. The Detective Bureau is investigating the incident". The SOPD also reported that a Lenox Avenue house was broken into, and a vehicle was stolen. "A Lenox Ave. resident stated that on Saturday 4-19-14 at approximately 4:40am he awoke to find an actor in his hallway. The victim stated that it appeared the actor was holding a weapon possibly a handgun however, the actor fled the scene upon seeing the victim and in doing so removed the victim's vehicle (2002 Lexus) from the driveway. The actor was wearing dark clothing and a ski type of mask covering his face. The Detective Bureau is investigating the incident". South Orange's annual River Day Celebration is scheduled to take place this year on Saturday, May 4 from 11:00am to 4:00pm. According to the River Day website, "South Orange River Day is an annual community gathering to clean up the South Orange section of the Rahway River, celebrate South Orange as a great place to live, and promote environmental education and awareness". There will be a volunteer cleanup of the East Branch of the Rahway River during the event. According to the South Orange Environmental Commission, those interested in volunteering should complete this form, bring waterproof boots or old sneakers, and "curiosity and a sense of community". Other activities include a wild edibles walk, ecology walk, and bike rally. There will also be a performance of the Rejuvenary River Circus from the Arm-of-the-Sea Theater, in addition to performances by guitarist Jonathan Fritz and the MapleBurn Quartet. The AmeriCorps NJ Watershed Ambassadors Program and the South Orange Greenway/Bikeway will each have displays at the event. Other exhibitors at River Day include the South Mountain Conservancy, South Orange Environmental Commission, Jersey Buzz Honey Cooperative and Farrell Field Park Association. Activities will take place at the Skate House near the Duck Pond off of Mead Street in South Orange. A full schedule of events is available at www.SORiverDay.org. Columbia High School in Maplewoood held its annual CHS-In-Action Night on Wednesday, April 16th. Hundreds of community members and local students attended the event, which featured many of the sports and clubs at Columbia High School. There were performances by CHS Band, Magic Club, Color Guard, Special Dance Company, Improv Club, Shakespeare Festival Club, Guitar Club, Step Team, and Friday Night Live (FNL) Club. There were also fencing demonstrations and tours of the Columbia Cable Network/SOMATV Studios. Visitors were also able to visit the CHS Science Fair. The event was presented by the CHS Club Council. Jersey Animal Coalition (JAC) officials are now due in South Orange Municipal Court next Tuesday, April 22, at 3:00pm on over 50 charges. JAC operates an animal shelter at 298 Walton Avenue in South Orange. The charges were issued to JAC on March 12 and March 25 following an inspection conducted by both village and state health officials. Ruth Perlmutter, the president and founder of the Jersey Animal Coalition is also due in court on two separate charges dating back to February. A statement from Perlmutter was posted on the Jersey Animal Coalition website today. In the statement, Perlmutter says "For those of you reading this who know me, you know that I have dedicated nearly a lifetime to the care and protection of animals. That lifetime passion, and my genuine belief that we are all God’s creatures, eventually led me to the world of animal rescue, which then led me to my work to help establish a no-kill animal shelter in South Orange through the Jersey Animal Coalition. After a lifetime of dedication to animal welfare, I handed my role to a new President. However, it came to the Board’s attention earlier this year that the person who took my place did not share the same passion and the same views for the protection of our animals. Therefore, our board had no choice but to remove that individual from office. I am proud to say that the board showed its faith in me by re-electing me as president. All this said, many of you, no doubt, have heard or read that in my absence, the shelter has come under severe scrutiny. At the moment, our shelter is under quarantine. In addition, the South Orange Department of Health has filed numerous charges against us for various health violations. Please know this….as the Jersey Animal Coalition President, neither I nor the board have no intention of dealing with these important issues through the press or by responding to false and slanderous internet postings and rumors. The Jersey Animal Coalition, through counsel, has denied all the charges against it, and will wage that battle in the appropriate forum – in court. As to the one thing which truly matters – our animals – know that the board and I are personally dedicated, as ever, to their health and well-being. And know that we are spending every waking hour fighting to get our doors re-opened – so that the Jersey Animal Coalition can continue to serve the community and provide salvation for these beautiful animals who all deserve a chance at life". Perlmutter had originally agreed to speak to Essex County Place regarding the shutdown of the shelter, but did not return our questions. South Orange Municipal Court is housed in the Maplewood Police and Municipal Court building at 1618 Springfield Avenue in Maplewood. South Orange and Maplewood's only animal shelter has now been closed for over a month. The Jersey Animal Coalition shelter on Walton Avenue in South Orange was shut down by the South Orange Village Department of Health in March following an inspection conducted by village health officer John Festa and Linda Frese from the New Jersey Department of Health on March 12. The inspection report said that the shelter was allegedly violating multiple state laws, and their were several other issues at the facility causing the shelter to be shut down. The report said that "the fire inspection unification posted at the facility showing evidence of a satisfactory inspection had expired" in 2013, "(paper) towels were not provided at several of the hand washing sinks located in the animal rooms and at the sink in the food preparation area", and dog crates were being used as "primary enclosures to house dogs in various locations throughout the facility". According to the report, four of these crates, which were constructed of an "inconsistent gauge wire to provide safe containment of the animals", were located in the education room, and intended for aggressive dogs. Furthermore, the report said that the crates "wobbled and started to tip when the dogs jumped on the sides of the enclosures". The report also said that one dog was being housed in the staff break room. Other findings from the inspection included pieces of dog treats on the floor, walls with water damage, a hole in the laundry room ceiling, a phone jack outlet without a cover plate in a free-roaming cat room, and dangling electrical cords, according to the report. The report also said that the village health inspector found dog feces throughout the parking area and outside grounds, in addition to a bag of dog feces "melting into the snow". There was an "excessive amount of clutter", and unlocked cabinets with medical supplies inside, the report continued. Plus, the report cited insufficient ventilation, animals showing signs of illness being kept in the same room as other animals, dogs being placed in previously inhabited enclosures without the enclosures being cleaned first, lack of records, feeding pans not being cleaned daily, and no evidence of sick or injured animals receiving "prompt basic veterinary care to alleviate pain and suffering". The report cited dozens of additional violations, including that "many of the animals" not being identified. Also mentioned in the report was that a sign on the front door indicated that the shelter was closed on Mondays, but the report said that the shelter is required to be open for public access for at least two hours every business day. Other animal shelters in Northern New Jersey are reacting to the shutdown. Suzanne Roman, the Executive Director of the Mount Pleasant Animal Shelter in East Hanover, said that "Mt. Pleasant is saddened by the situation with JAC and hopes their problems can be addressed, then monitored to ensure the best possible care for the animals entrusted to them". Roman said that the JAC shutdown has caused minimal impact to the Mount Pleasant Animal Shelter. A representative for the Proud Animal Welfare Society (PAWS) of Montclair said "we lost our shelter at the end of 2008 so I think we know how they (JAC) feel, we took all our animals with us when we closed and now we are a foster network". Lisa Esak of the Ramapo-Bergen Animal Refuge shelter said the the JAC shutdown "does not have a tremendous affect on us other than that there is always an overwhelming number of homeless animals and people looking to surrender animals and a shortage of places for them to go regardless. That unfortunately doesn't seem to change." Regarding how the village has been impacted by the shutdown of the shelter, South Orange Village President Alex Torpey told Essex County Place that "the day-to-day services which the residents receive have not been affected. The Village has contracted with Associated Humane in Newark." The Jersey Animal Coalition shelter was where stray animals found in both South Orange and Maplewood were delivered before the shelter was shut down. The president of the Jersey Animal Coalition, Ruth Perlmutter, originally agreed to comment for this story, but then did not return our questions. A statement on the JAC website says the the coalition is "working diligently to ensure that (the shelter) will reopen in a timely manner...as always, the health and safety of the animals in our care is our primary concern". The statement also says that "over the last few months, rumors, both real and perceived, have been flying about the shelter’s operations and future. Please be assured that the JAC Board is aware of everything, has been conducting its own ongoing investigation and is taking action. As a result, we took significant steps last month to rectify the source of many of these problems. We are looking forward to working closely with the State and the Village of South Orange so that together we can bring the Shelter back to its pre-eminent role as a community resource, and as one of the very few 100 percent no-kill shelters in the Tri-state area. Community support matters more now than ever. We thank you for your past, present and future support of JAC in keeping no-kill a reality in NJ." The coalition says that donations are needed now "more than ever, since...adoptions have been stopped". When Essex County Place visited the shelter on April 14, a man who identified himself as a volunteer said that the shelter is in desperate need of donations. "Because of the vindictiveness of some of the volunteers, the only ones who really got hurt (by the shutdown) were the animals", said the volunteer, who said he is not employed by the coalition. According to the volunteer, the animals who live in the shelter have been locked in cages since the shelter was shut down. Pointing to a dog who he was bringing out of the facility, he said that many of the animals have become "very aggressive" because of this. The volunteer declined to give his name, but claimed that there were some volunteers who "weren't walking the dogs properly", and therefore were terminated by the coalition. "People found reasons to pick on the shelter", the volunteer said, alleging those volunteers reported the shelter to the village for various violations. South Orange Deputy Administrator Adam D. Loehner told Essex County Place that "under the quarantine, no animals should leave the facility (shelter grounds). As for volunteers it is up to the vet of record to determine who needs to be there to ensure the animals are well cared for. The Village has asked the shelter to only walk animals on their property to ensure each animal is getting enough exercise time to maintain good health". Donna Leusner, the director of communications for the New Jersey Department of Health told Essex County Place that "the Department (of Health) provided technical assistance to the South Orange Health Officer during the inspection. The New Jersey Department of Health does not have jurisdiction over animal cruelty situations but we were informed by the South Orange Health Officer that he notified the New Jersey Society for the Prevention of Cruelty to Animals (NJSPCA) of the conditions under which the animals were held at the facility". The Jersey Animal Coalition is due in South Orange Municipal Court in Maplewood tomorrow at 3:00pm on 51 charges. Ruth Perlmutter, JAC president, faces two different charges dating back to February. Perlmutter has pleaded not guilty, and JAC did not file a plea. According to a press release from Essex County Public Information Officer Anthony Puglisi, the $30 Million renovation of the South Orange Avenue 'S-Curves" is the "largest road improvement project undertaken by Essex County in the last generation". The release said that the project will "flatten the curves in the road, enhance motor vehicle safety and storm drainage, and make the road meet modern traffic design standards". Although the construction is expected to last for the next two years, lane closures are not anticipated, according to the county. "The public relies on our network of County roads to travel to work, school and conduct their daily lives, and South Orange Avenue is a major east-west thoroughfare. While stretch of road through Essex County South Mountain Reservation offers some picturesque views, the sharp turns and lack of shoulders on the side of the road create hazardous driving conditions and are prone to flooding", Essex County Executive Joseph DiVincenzo, Jr. said in the release, mentioning that federal money will be used as part of the project. DiVincenzo added that the "Federal Highway Administration identified this section of South Orange Avenue as being dangerous over a decade ago". French and Parrello Associates received a $1.6 million contract to design the roadway improvements, the release said. New Prince Concrete Construction from Hackensack was awarded a publicly bid contract for $25,915,389.50 to perform the construction. The Essex County Public Works Department is monitoring the project to ensure delays are avoided. · The roadway will be re-aligned to reduce the sharpness of the curves. · The roadway will be widened so that a shoulder can be created in the eastbound direction. · Traffic signal equipment at the intersections of Brookside Drive/Cherry Lane in Millburn and Glenview Road in South Orange will be modernized. · Retention swales along the side of the road will be constructed to address flooding and reduce water runoff from the road into the reservation. · Guide rails and lighting will be installed to enhance safety. The new lights will include traditional overhead cobra-head street lights and decorative gas-lamp style lamps. · A new pedestrian bridge over the roadway near the Girl Scout Camp and an existing pedestrian and equine bridge will be reconstructed. The two bridges will be designed with stone facing to complement the natural area of the reservation. · Turnoff and parking areas will be upgraded to improve sight lines and make it easier to exit and enter the roadway. This will enhance access to walking trails that start or pass by these parking areas. · More than 3,600 trees and additional landscaping will be planted to replace the 430 trees that were cut down. In addition, areas in the reservation that were affected by Hurricane Sandy will be replanted. The Maplewood Department of Public Works is asking that Maplewood commuters complete a brief survey on the township website regarding the Maplewood Jitney service. "Being that people can pay $1.00 to ride the bus instead of purchasing a pass, it is hard to an accurate count of how many people use this service", Maplewood DPW director Eric Burbank told South Orange Maplewood Place. The survey asks questions regarding how often residents use the jitney, which jitney route and train they use, and whether or not the jitney is usually on-time. "The commuters should take the survey so I can have better feedback and make adjustments where needed so to provide them with the best service possible", said Burbank. The survey will be available until 9pm on Sunday, April 13. Only one survey may be completed per Jitney user. The Board of Directors of the Maplewood Village Alliance have approved the current design of a proposed mixed-use building at the site of the main Maplewood Post Office in Maplewood Village. According to a statement on the Maplewood Township website, "This approval came after a collaborative process of almost 20 hours of meetings and negotiations between the developers, the Village Alliance's Post Office Design Review Sub-Committee and the Township". Part of the project plan includes for the Maplewood Post Office will be torn down and relocated, and a new building with residential and retail space to be built. According to the statement, "the developer's selection of final construction materials and signage will similarly need approvals by the Village Alliance". The developer for the project is L&M Development Partners of Westchester County, NY. The Maplewood Village Alliance is the non-profit management agency of the Maplewood Village Special Improvement District. The Columbia High School Club Council has announced that the 2014 CHS-In-Action Night will be on Wednesday, April 16th from 6:30PM to 9:30PM. An email to middle school and high school parents said that "Columbia’s Student Council is cordially inviting the entire South Orange-Maplewood community, especially middle school students and their parents, to come and see what CHS is all about". The Special Dance team, Shakespeare Festival club, and Step Dance team will each be performing at CHS-In-Action Night, in addition to the Columbia High School Band, State Champion Fencing team, and Acapella Choir. "Every group and organization present will have representatives eager to speak to the community members and introduce 8th graders to our CHS family", said the email, "CHS-in-Action (Night) is a great way for middle school students and their parents to see and get excited about all of the amazing activities going on at CHS". Attendees will be able to climb to the Astronomy Club observatory at the top of the clock tower, and take a behind-the-scenes tour at the Columbia Cable Network (CCN) studios. Attendees can also visit the Columbia High School Science Fair. Columbia High School is located at 17 Parker Avenue in Maplewood. First on PlaceNJ.com: Changes may be coming to the parking lot at the Maplewood Women's Club. According to the agenda for the Maplewood Township Planning Board Meeting tonight, the Planning Board will discuss "parking lot improvements to reconfigure lot and to create additional parking. Improvements include an underground detention system, new curbing, pavement, striping, landscaping, lighting and fencing". Several Maplewood residents have already voiced opposition to the project. "Given the controversy over storm water runoff remediation in the (South Mountain) reservation, we shouldn't be blatantly contributing to the problem by paving over more land", Maplewood resident Jonathan Poor told South Orange Maplewood Place. "Even if parking is a legitimate problem...this is way too high a price to pay". New Jersey American Water, the water supplier for Maplewood and Millburn. has announced that crews from NJAM will be working on Wyoming Avenue in Maplewood and Millburn from on/around April 10th to November as part of a $4.2 million water service improvement project. "Nearly 22,000 feet of six-inch, unlined cast iron water mains will be cleaned of the minerals and sediment that has built up over time along the inner walls, and then the water mains will be lined with a cement coating", said Richard G. Barnes of NJAM in a press release. According to the release, the current water mains have served Maplewood and Millburn residents, and this project will give the water mains "a new lease on their usefulness". NJAM crews will be working on Wyoming Avenue between Sagamore and Ridgewood, Claremont Avenue, and Linden Street from 7:30am to 5pm. NJAM says that "while the work is ongoing, there will be minimal water service disruption for customers. The water services connected to the mains being cleaned and lined will be temporarily relocated to above ground, bypass mains". Barnes told Essex County Place that the work will not require NJAM to close entire streets, but there are areas where traffic will be reduced to one lane during working hours. According to Barnes. traffic will go back to multiple lanes when the work is suspended for the evening hours. 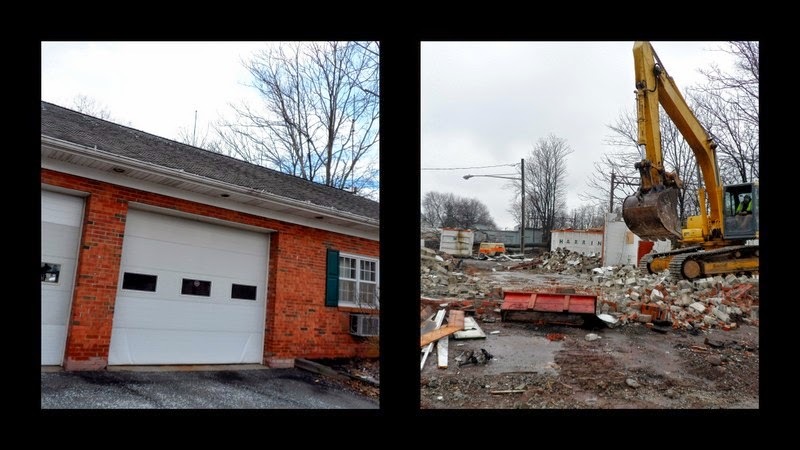 The former South Orange Rescue Squad headquarters on Third Street in South Orange was torn down on Friday. Construction workers demolished the building to make way for Third and Valley, a new residential and retail development. The rescue squad is temporarily operating out of an apartment and garage at 13 4th Street, but will eventually move to a new building next to the South Orange Fire Department. The Jonathan Rose Companies, the developer for the Third and Valley project, donated $1.1 million to the rescue squad in order to help pay for the new building. Third and Valley is expected to be completed in late 2015, and will be home to 215 apartments, 3,000 square feet of retail and office space, and a new parking garage. A new bakery and internet cafe is set to open on Springfield Avenue on Saturday. 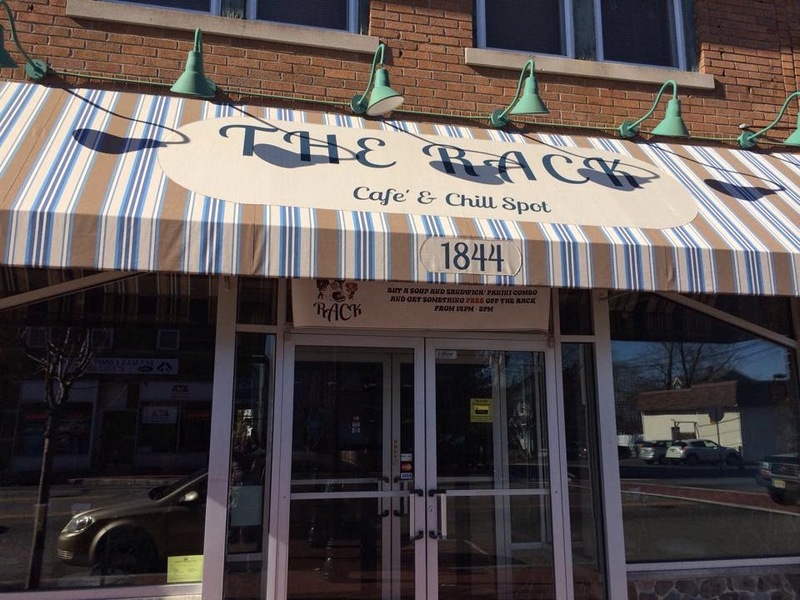 Called 'The Rack Cafe and Chill Spot', it will serve soups, sandwiches, panini, coffee, and various baked goods. Owner Omosede Ayinde says she decided to open a cafe on Springfield Avenue because she "likes the area" and that fact that it is convenient to public transportation. "We found a location that is perfect for what we're looking to do", said Ayinde. "There's nothing much like our cafe in that neighborhood". The Rack will hold a grand opening celebration and ribbon cutting with Maplewood Mayor Vic DeLuca and other township officials on Saturday, April 5th at 10:00am. From 10:00pm to 1:00pm, everything on the menu will be 10% off. There will be a free cookie giveaway for children while supplies last, and free samples of most baked goods. The Rack is located at 1844 Springfield Avenue in Maplewood between Oberlin and Yale Streets.